The confectionery industry is one of the most stable sectors of the food industry. 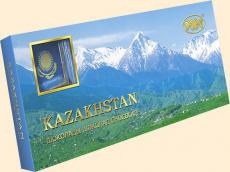 In recent years, there has been a tendency to increase the share of Kazakh confectionery products in the domestic market. This is facilitated by the State Program of Industrial-Innovative Development of Kazakhstan for 2015–2019. Kazakhstan became the leader in imports of Russian chocolates in 2018. The country has purchased 17.4 percent of confectionery products, according to the official website of the Mayor of Moscow. By the end of 2018, a record was set in exports of local chocolate and sweets in Russia. Imports grew by 11 percent and amounted to about 479,000 tons. The leaders in imports became Kazakhstan (17.4 percent), Belarus (14.1 percent) and China (11.1 percent). Last year, 183,797 tons of chocolate and sugar confectionery products were produced in Moscow. This is two percent more than in 2017. "The largest confectionery factories in the country with a rich history are located in the capital. Enterprises are industrial complexes and have tax benefits for profits, property and land," said Alexander Prokhorov, head of the Moscow investment and industrial policy department. Saved funds allow enterprises to increase production capacity and expand the range of products, he concluded. Four large companies today provide about 85 percent of the total Kazakh domestic production in the confectionery industry. These are “Rakhat ”, “Bayan Sulu”, “Almaty Product” and “Hamle”. Another major player, Karaganda Candy, has suspended production for the purpose of modernization and is in the process of seeking funding, being in the same situation as the Aktyubinsk confectionery factory. The potential of the food industry of Kazakhstan allows the industry to significantly increase production volumes, thus ensuring both the needs of the domestic market and export for the main food groups. Kazakhstan has all chances to become not only a large raw material exporter but also a developed agricultural country with a broad export line of organic agricultural products. Increasing the dynamics of indicators of the food industry and the agro-industrial complex will help to improve the quality of life of the population and ensure the food security of Kazakhstan. Diplomatic relations between Kazakhstan and Russia were established on October 22, 1992. The trade turnover of Kazakhstan and Russia amounted to $ 17.6 billion in 2018. This is 7.2 percent higher than the previous year. According to the figures for January-November 2018, Russia ranks first in terms of imports to Kazakhstan. Russia's share among the countries supplying products to Kazakhstan is 37.3 percent.